The Payment of Gratuity (Amendment) Bill, 2018 has been passed by the Lok Sabha on 15th March, 2018 and by the Rajya Sabha on 22nd March, 2018. The Bill has been assented to by the Hon'ble President and, notified by the Government and has been brought in force from 29th March, 2018. The amendment seeks to increase the maximum limit of gratuity from Rs. 10 Lakhs to Rs. 20 Lakhs. The objective is to make employees in the private sector as well as public undertakings and autonomous organisations under the government who are not covered under the Central Civil Services (Pension) rules, eligible to receive higher amount of gratuity. The amendment will also provide higher tax benefit for those employees who are covered under The Payment of Gratuity Act, 1972 ("Gratuity Act") and who are entitled to receive enhanced gratuity benefits. Gratuity received by Government employees is completely exempt under the income-tax Act, whereas gratuity received by non-government employees is exempt subject to certain ceiling limits. In this article we shall look into the background, the impact of the amendment and the accounting implications under Indian Accounting Standards notified under Companies (Indian Accounting Standards) Rules, 2015 (Ind AS) and under Accounting Standards (AS) under the Companies (Accounting Standards) Rules, 2006. 2. The Gratuity Act intends to provide social security to employees after retirement and is applicable to enterprises with ten or more employees. The Act provides for payment of gratuity on account of retirement/superannuation/resignation/any physical impairment during the employment. Further, as per the rules, an employee is required to complete five years of continuous service (subject to certain exceptions) in order to be eligible for the payment of gratuity. Gratuity is an important social security legislation to wage earning population in industries, factories and establishments. Eligible employees, covered under the Gratuity Act are entitled to it and is calculated at the rate of 15 days salary (based on last drawn salary), for each number of completed years of service. Prior to the amendment coming into effect, the employees of Government enterprises were entitled to a maximum amount not exceeding Rs. 10 lakhs. Many private sector enterprises also follow this ceiling and limit the entitlements of their employees. Even though there is an upper limit, the Gratuity Act also provides that an employee has the right to receive a higher amount under any award or agreement or contract with the employer (better terms of employment). An employee who has rendered 25 years of service with a monthly salary of Rs. 1 Lakh (at the time of retirement), is eligible to receive Rs. 14.42 Lakhs (15/26 x 1,00,000 x 25 years) as gratuity. This amount would have been otherwise restricted to Rs. 10 lakhs under the earlier provisions for government enterprises and private enterprises who followed the limit (unless agreed for a higher limit as better terms of employment). Also, the tax exemption in the hands of the employees under Income Tax Act, would have been restricted to Rs. 10 Lakhs under the earlier provisions. 3. The erstwhile upper ceiling limit on gratuity amount was Rs. 10 Lakh. The provisions for Central Government employees under Central Civil Services (Pension) Rules, 1972 with regard to gratuity are also similar. Before implementation of 7th Central Pay Commission recommendations, the ceiling under CCS (Pension) Rules, 1972 was Rs. 10 Lakh. However, with implementation of 7th Central Pay Commission recommendations, in case of Government servants, the ceiling limit has been raised to Rs. 20 Lakhs. The amendment allows the government to increase the gratuity ceiling limit from time to time without amending to the law. Considering the inflation and wage increase even in case of employees engaged in private sector, the Government decided that the entitlement to gratuity should also be revised in respect of employees who are covered under the Payment of Gratuity Act, 1972. Accordingly, the Government has increased the maximum limit of gratuity to such amount as may be notified by the Central Government from time to time. The Government has issued the notification specifying the maximum limit of Gratuity to Rs. 20 Lakh. In addition, the amendment has revised the provisions relating to calculation of continuous service for the purpose of gratuity in case of female employees who are on maternity leave from 'twelve weeks' to 'such period as may be notified by the Central Government from time to time'. This period has also been notified as twenty six weeks. The amendment would increase the limit of gratuity benefits that employees would get and also increase the tax-exempt gratuity amount in the hands of the employees. This will immediately benefit mostly those who are in high salary bracket. How will companies be impacted by an increase in gratuity limit? 4. Companies need to carefully examine the impact of the change, as well as the financial impact on the financial statements of FY 2017-2018. The companies (those who followed the erstwhile limit of Rs. 10 Lakhs) will be affected by the increase. The impact of the amendment will be recognised in the financial statements for the current financial year; i.e., FY 2017-18. The amendment would cause an increase in the employee gratuity benefit obligations, classified as defined benefit plans. 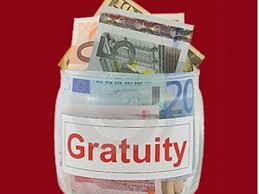 The increase in gratuity limit will affect the benefits already accrued, since the time of an employees' joining date. Under both Ind AS 19 Employee Benefits and AS 15 Employee Benefits, past service cost is the change in the present value of the defined benefit obligation resulting from a planned amendment or curtailment. Therefore, the amended increased limit would qualify as a past service cost. The increase in liability will be needed to be recognised through a corresponding charge to profit and loss account. The timing of the charge in profit and loss will be different for Ind AS 19 and AS 15. (b) when the entity recognises related restructuring costs (see Ind AS 37) or termination benefits (see paragraph 165). (b) the date when further service by the employee will lead to no material amount of further benefits under the plan, other than from further salary increases. Vested component is the past service cost in respect of those employees that have completed the minimum of 5 years of service as at 29 March 2018, and are entitled to receive gratuity immediately if they leave the company. Vested past service costs are required to be recognised immediately in the profit and loss account. Non-vested component is the past service cost in respect of those employees who have less than 5 years of service. Deferral of the non-vested past service is permitted over the average remaining period until vesting. For example, if on an average certain class of employees have less than 5 years of completed service in the entity, have an average past service of 1 year. The non-vested past service cost arising on account of the amended ceiling can be deferred over the remaining 4 years until it is vested. This would mainly impact companies which have significant number of new employees. 7. Companies should carefully evaluate the impact of the amendment on the financial statements of FY 2017-18. Companies which used to limit their employees' gratuity payouts, including government companies, to Rs. 10 Lakh prior to the amendment may witness a significant financial impact arising on account of the amendment. The actuarial valuation exercise for FY 2018-19 and quarter ending 31 March 2018, for listed entities, should include an examination of the impact of the amendment. It is recommended that the impact of the past service cost arising on account of the amendment should be appropriately brought out in the financial statements by way of a disclosure.